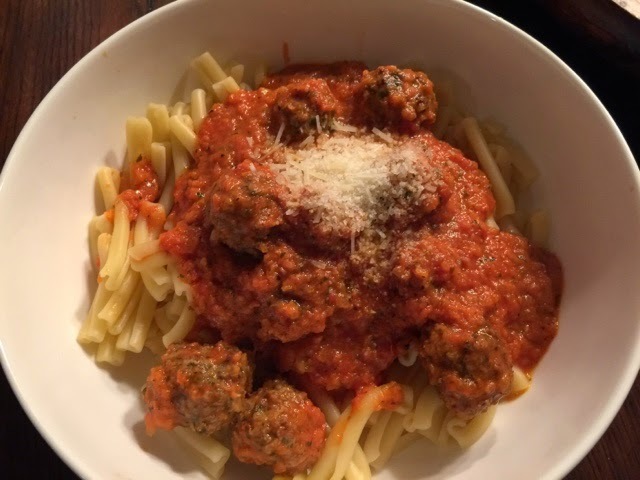 I needed to make spaghetti sauce to go with the meatballs so I came up with a quick and easy one. In my le creuset over medium heat I coated the bottom with butter. Added in the garlic and onion and cooked until softened. Next, I added in the cans of tomato and all spices. Then I turned it down to low and let it simmer for 1 hour stirring occasionally. After that, I pureed the sauce and then added in the cream. I then let it cook for another 15 minutes. To finish off my sauce I added in the meatballs and let it simmer for another 30 minutes.